The R&A and the USGA have announced amendments to the new rule regarding caddies helping their players with alignment in response to the incidents involving Li Haotong and Denny McCarthy. Li was handed a two-stroke penalty for a breach of Rule 10.2b(4) on the final green of the Dubai Desert Classic, when it was determined that his caddie had been standing behind him when he "began to take a stance for the stroke". McCarthy was hit with the same punishment for a similar incident in the second round of the Phoenix Open, but his two-stroke penalty was rescinded a day later after rules officials deemed he had not been taking his stance for a pitch to the green, and he had actually backed away before going through his actual shot process. Veteran PGA Tour rules official Slugger White explained the difference between the two incidents at the Sky Cart in Phoenix, and hinted that the description of the new rule, brought in at the start of the year, needing amending to make it clearer when determining when to impose a penalty. The R&A and the USGA later released a statement vowing to revisit the wording of Rule 10.2b(4) and provide "necessary clarification", and they have now issued a new version of the rule which they believe will "give the players more opportunity to avoid a breach." A joint-statement detailing the clarifications read: "The purpose of Rule 10.2 is to reinforce the fundamental challenge of making a stroke and to limit the advice and other help a player may receive during a round. "Rule 10.2b(4) ensures that aiming at the intended target is a challenge that the player must overcome alone. It states: 'When a player begins taking a stance for the stroke and until the stroke is made, the player's caddie must not deliberately stand in a location on or close to the player's line of play behind the ball for any reason. If the player takes a stance in breach of this Rule, he or she cannot avoid penalty by backing away. "Exception - Ball on Putting Green: When the player's ball is on the putting green, there is no penalty under this Rule if the player backs away from the stance and does not begin to take the stance again until after the caddie has moved out of that location. 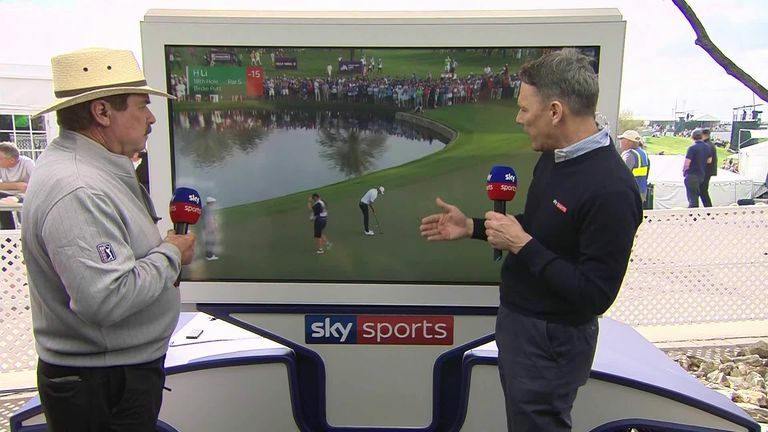 PGA Tour rules official Slugger White explains why Denny McCarthy's two-shot penalty was reversed in Phoenix while also insisting that Li Haotong's penalty in Dubai was correctly imposed. "Meaning of 'Begins Taking a Stance for the Stroke': If a player backs away from a stance, the player is not considered to have begun a "stance for the stroke". Therefore, a player can now back away from his or her stance anywhere on the course and avoid a breach of Rule 10.2b(4) if the caddie had been standing in a location behind the ball. "Examples of When a Caddie is Not 'Deliberately' Standing Behind the Ball When a Player Begins Taking Stance for Stroke: As written, the Rule does not apply if a caddie is not deliberately standing behind a player. It is clarified that the term 'deliberately' requires a caddie to be aware that 1) the player is beginning to take a stance for the stroke to be played and 2) he or she (the caddie) is standing on or close to an extension of the line of play behind the ball. Several examples are given in the clarification to provide additional guidance." David Rickman, the executive director for governance at The R&A, said: "These clarifications are designed to improve the operation of the Rule and give the players more opportunity to avoid a breach while remaining true to the purpose of the Rule. "We appreciate that this requires some players and caddies to make an adjustment but we believe there is widespread acceptance that it is for the player alone to line up a shot." Rickman's counterpart at the USGA, Thomas Pagel, added: "Experience has taught us that introducing a new Rule requires us to balance patience with a willingness to act quickly when necessary. "With so many pivotal changes to the Rules this year, we've committed to offering any assistance needed in making the Rules easier to understand and apply, without taking away the inherent challenge of playing the game. We appreciate that everyone involved in drafting these clarifications worked together with this same goal in mind."